The Israeli military tried to put a positive face on the Moscow talks, describing them as friendly and positive, including even an Israeli invitation to the Russian investigators to come to Israel to further pursue their inquiries. This was in striking contrast to the hostile Russian media coverage of the tough interviews. The Russians insisted that, when Syrian air defenses shot down the Russian Ilyushin-20 spy plane, an Israeli air raid was still ongoing in Latakia, whereas the IDF probe established that the Israeli fighter jets had returned to home base. That was one of several points of discord. The plane was struck by large Syrian SA-5 anti-air missiles. The Syrian missile barrage went on for 40 minutes – after Israel planes were gone and landing at their home base. A video recording of the conversation between the Israeli Air Force Command in Tel Aviv and the Russian Khmeimim Air Base proves that Israel gave the Russians much longer than one minute’s notice of the coming air raid over Latakia and disproves the Russian claim. 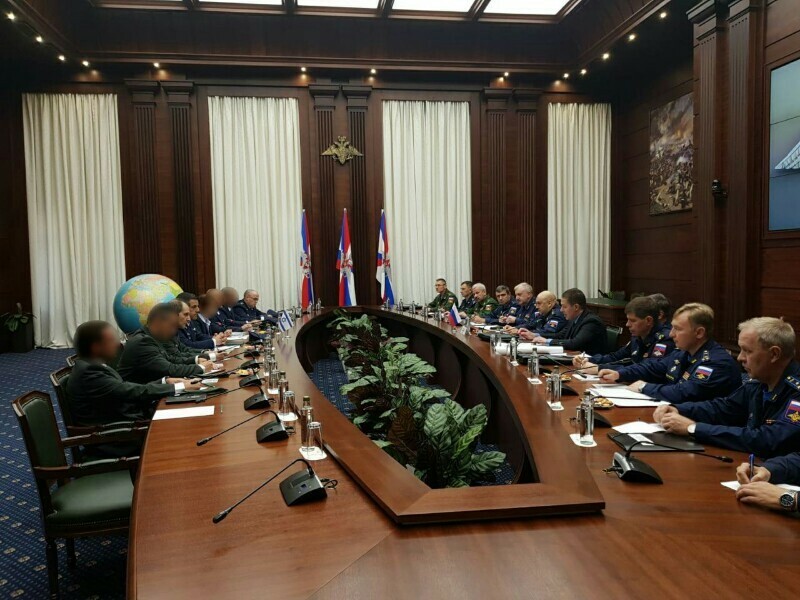 The Israeli delegation presented evidence disproving the Russian MoD’s accusation that the Israeli jets acted provocatively in using the Russian aircraft against Syrian missiles. 1. Evidence of Iran’s deepening military presence in Syria. 2. Tehran’s exploitation of Syria for funneling strategic weapons to Hizballah. 3. The Israel air raid over Latakia and how the Russian reconnaissance plane came to be shot down by Syrian air defense fire. The Russian version of the Ilyushin incident and the Israeli delegation’s findings – as released to local media on Friday. As to the future impact on Russian-Israeli relations of the plane incident, that decision is up to President Vladimir Putin, as DEBKAfile reported earlier. He will also decide to what extent – if at all – the Israeli air force will continue to enjoy free rein to pursue its government’s objective of ridding Syria of Iran’s military footprint. For now, it is too soon to predict Putin’s response, our sources confirm. Kremlin spokesman Dmitry Peskov told reporters in Moscow on Friday that President Putin had been briefed on what an Israeli military delegation had to share with the Russian Defense Ministry on the downing of its jet in Syria, but stressed a decision on the Kremlin’s next step was premature. “It is too early to ask about that. You should ask the Defense Ministry,” Dmitry Peskov told reporters in Moscow after a query about the Russian government’s future relationship with Israel. The spokesman confirmed that Putin was “aware of the information” presented, but added this was “special data,” and only military experts were capable of saying whether it was satisfactory.